إذا كنت تبحث عن فندق بموقع جيد في جولد كوست، فقد وجدت ضالتك في فندق مانترا أون فيو . يحظى هذا الفندق ذو 4.5 نجمات بمكان ممتاز يسمح بالوصول إلى المعالم السياحية الأكبر في المدينة، فهو يبعد مسافة 1 km عن صخب المدينة. إن سهولة الوصول من الفندق إلى المعالم السياحية الشهيرة الكثيرة في المدينة كمثل Infinity, Racecentre, Hot Air Balloon هو استثنائي بحد ذاته. كما يقدم فندق مانترا أون فيو الكثير من الخدمات لإغناء رحلتك في جولد كوست. لضمان راحة ضيوفه، يقدم الفندق الخدمات التالية: خدمة الغرف على مدار الساعة, مكتب الاستقبال على مدار الساعة, تسجيل وصول/خروج سريع, تخزين الأمتعة, واي فاي في المناطق العامة . تتضمن كل غرف النزلاء وسائل الراحة والتسلية المصممة خصيصاً لضمان الراحة القصوى للضيوف. يمكنك الاستمتاع بالأجواء المريحة التي تقدمها حوض استحمام ساخن, مركز للياقة البدنية, مسار جولف - ضمن 3 كم, حمام سباحة خارجي, سبا طوال النهار. يشكل فندق مانترا أون فيو بخدماته الراقية وموقعه الممتاز، قاعدة مثالية للاستمتاع بإقامتك في جولد كوست. لا يمكن للعقار قبول طلب "إطلالة على المدينة" إلا إذا اختار النزلاء نوع الغرفة المطلة على المدينة عند الحجز. لا يمكن للعقار قبول الطلبات الخاصة لأسرّة الأطفال والأدوار العليا. يوجد مكان خارجي لانتظار السيارات نظير رسم إضافي بقيمة 8 دولارات أسترالية في الليلة، وحد ارتفاع السيارات المسموح به في هذا المكان هو 1,9 متر. تتوفر خدمة صف السيارات مقابل 15 دولار أسترالي في الليلة. تتوفر مواقف السيارات في موقف السيارات العام المجاور، ويبلغ أقصى ارتفاع للسيارات المتجهة إلى موقف السيارات 1.9 متر. تبلغ تكلفة مواقف السيارات الذاتية 8 دولارات أمريكية لكل سيارة لكل 24 ساعة، وسيتم تطبيق رسوم إضافية بعد 24 ساعة. تتوفر خدمة صف السيارات أيضًا مقابل 15 دولار أمريكي للسيارة الواحدة لكل 24 ساعة، وسيتم تطبيق رسوم إضافية بعد 24 ساعة. تتوفَّر خدمة انتظار السيارات لقاء رسم إضافي مع مراعاة أنّ الارتفاع المسموح به هو 1,9 أمتار. 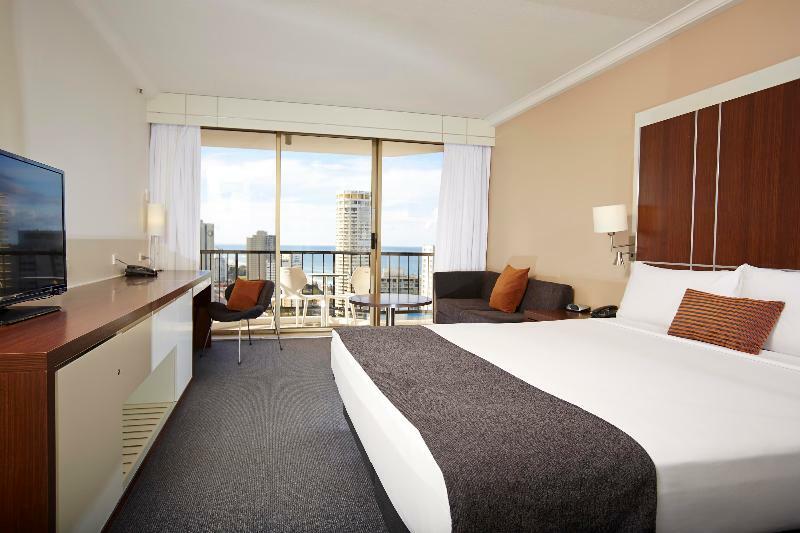 The location is very good, near surfers paradise. It wasn’t worth the money, the hotel didn’t even provide water. Booked a few nights last minute for new years eve. The location is good and we faced out to partial ocean views and the bungee ride location. Amenities are good and staff were ery pleasa t at the fro t desk. My only complaint is we didnt book breakfast ahead and the sign on reception says $20. Our first mornung we were garged $25 ea as we didnt book ahead!!! Wow what difference should that makr. They also charge an extra $5 to make an omelette and extra for a cappuccino so that makes it it quite expensive. Only an average breakfast so we ate out with a seaview a lot cheaper. Parking was an extra $24 for 3 nights so that was reasonable. I am a mantra member but unfortunately they couldnt match the deal i got with agoda. Otherwise pool area and rooms are nice. We arrived late and the staff was more than accommodating! Lobby is huge, elevators are clean, hallways are abit outdated but no biggie, we had the high view king suite and the room was beautiful. Beautiful beach and city view. Bathroom was very clean and spacious, plenty of cardboard space, the bed was my FAVOURITE! Balcony was big enough for us. Kettle and mini bar was provided. Location was perfect we had a 24 convenience store underneath us and a tram stop our front. The beach and city central were all within walking distance. Staff was great and always willing to go above and beyond! I will definitely be coming back. Thank you Mantra on View! 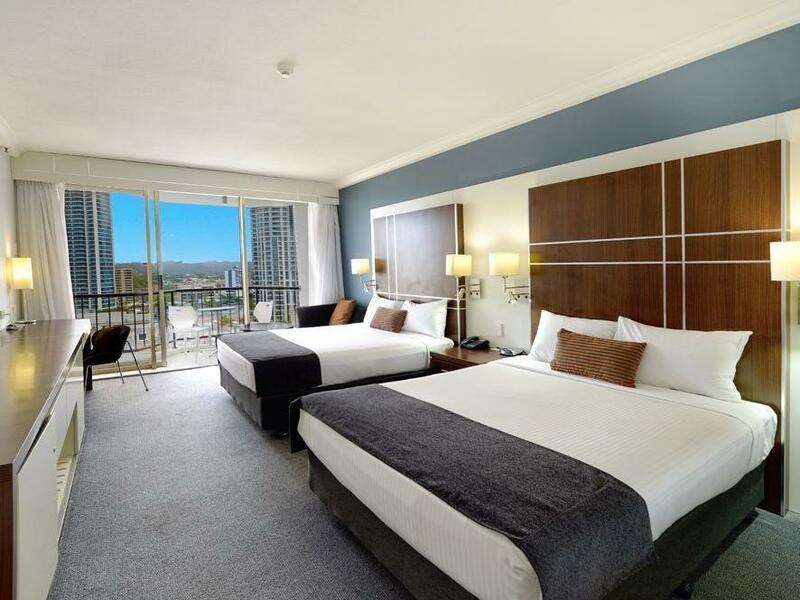 The Mantra On View Hotel is situated right near Surfers Paradise beach, close walk to all of the shops, as well as easy parking and access for friends to visit. It's an older hotel, but the staff do their best to help, support and make sure all guests feel comfortable during their stay. 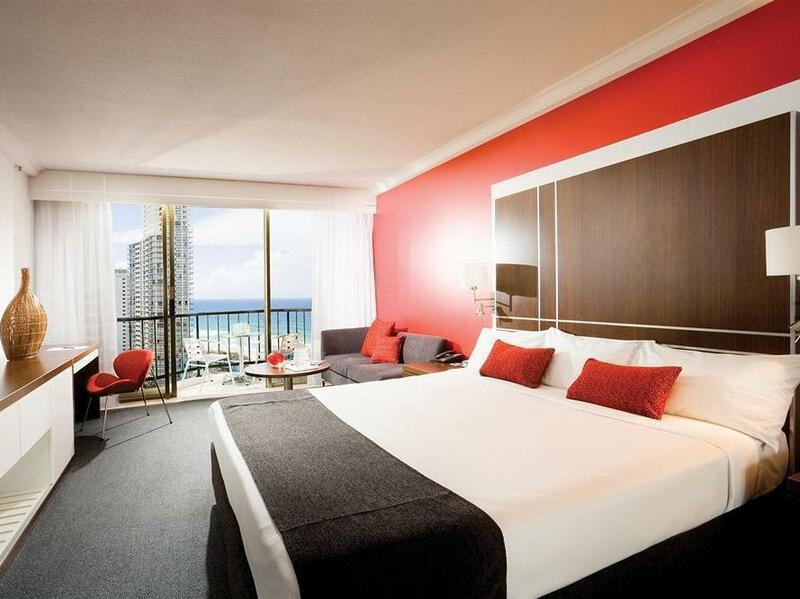 I'd recommend Mantra On View for people to stay in Surfers Paradise. The hotel location is great with close access to the light rail and beaches. Room was very comfortable and well appointed, apart from a microwave which would have been nice. There were renovations underway and resulting lack of elevator access to the car-park which was very inconvenient. The daily buffet breakfast was superb and staff very friendly and efficient. Comfy room, convenient location close to main streets and restaurants. Since we booked the Ocean view room, we didn't miss the sunset and sunrise. We were lucky to be served by friendly receptionists who really made our stay even better. Just to take note that the hotel is using the car park building which appeared to be shut down (all floors were closed with no lights and the lifts were broken too), we had to walk all the way from the top floor car park (Mantra's guest level) staircase (maybe 3-4 floors) to the ground floor and walked for 5 - 10 mins to the hotel entrance. The location is very nice near sea, shopping. If the breakfast menu is not same over 1week, it is much better. We only stayed here for 2 nights for the AFL game but it was clean, comfortable and quiet. In a great location being close to both the beach and public transport. Also very close to the nightlife that the Gold Coast has to offer. Would recommend this place and stay here again. Good value for money. The rooms were big and clean. The location was excellent. We took the public buses to Sea World, Movie World and Wet n Wild and it was a short was to and from the bus stops. There is also a tram station nearby. The beach and central part of town was also very close. For those staying long term and are looking for a launderette, there is Laundry House about a 10-15 minutes walk away (depending on your speed). it was good. we had a room with great view and is near to shopping areas, restaurants, bars etc. it is a minute's walk to the beach too. Only issue was that we had really noisy neighbours and we could hear them all night. besides that, nth wrong with the hotel! We weren't really expecting much since the rooms were on sale and we booked it on a whim, so we were pleasantly surprised with the size of the room/beds + the good location/views. My family and I will definitely be back!